3. Line your table with a double layer of the Sunday paper. 4. 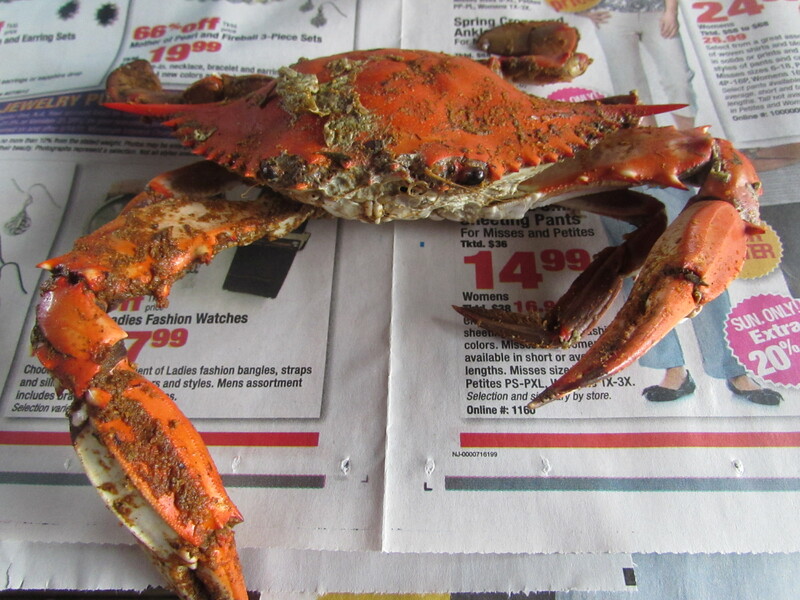 Buy Old Bay seasoned, steamed crabs and beer (preferably Maryland brewed Dead Rise Old Bay Summer Ale). Side dishes are incidental. 5. Use a mallet and your hands to get at the meaty goodness. 8. 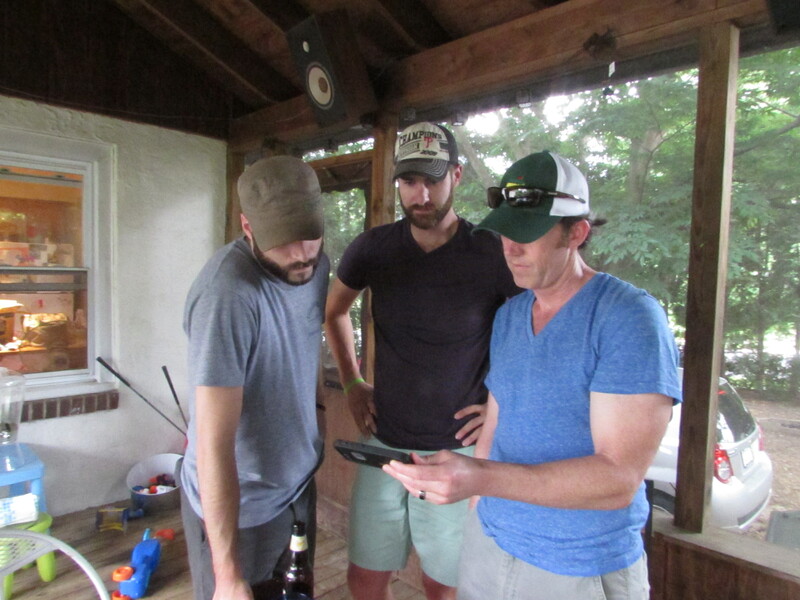 Take time out to check the score on the World Cup game. 10. See who can make the biggest shell pile. 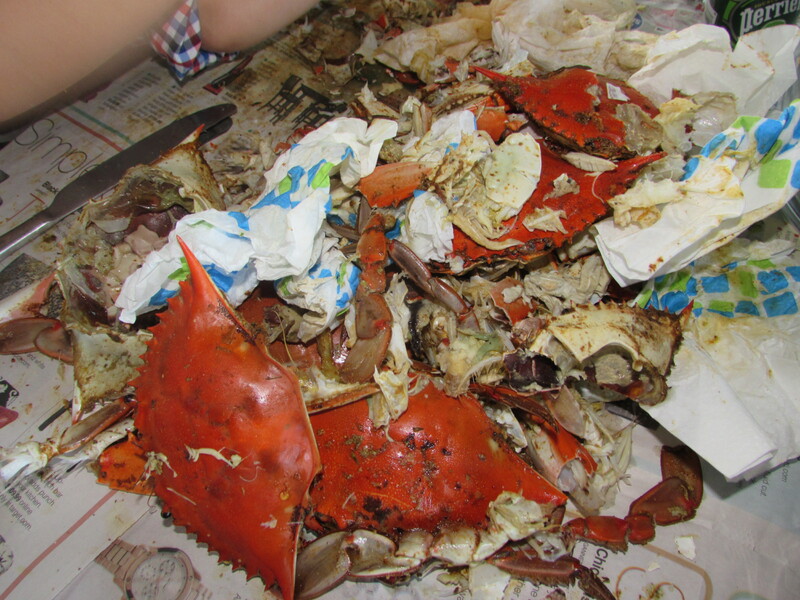 Thanks to BnB Seafood in Elkton, MD (but mostly to Kevin, Tiffany, Adam and Lindsey) for the crab feast! 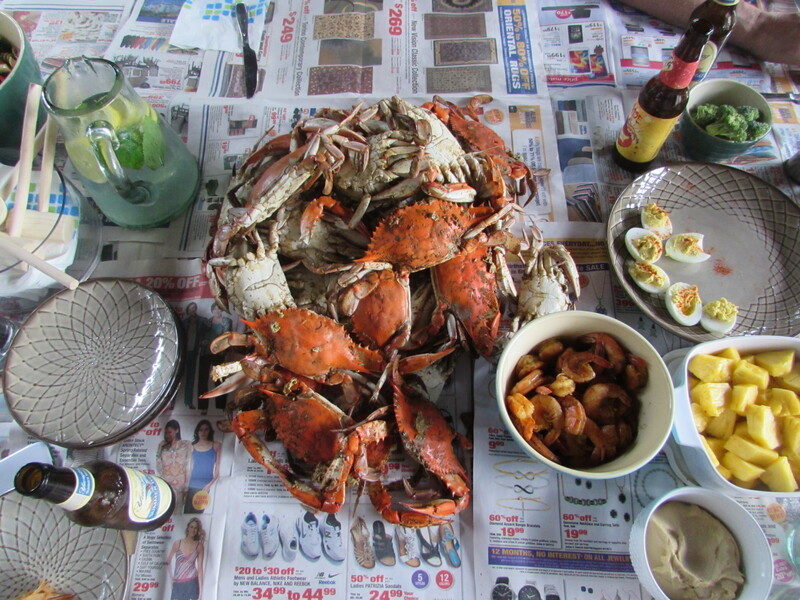 Have you ever enjoyed a Maryland-style crab feast? What’s your summer tradition? Thanks! I’m a New England girl, so my idea of seafood is fish, scallops, and lobster. 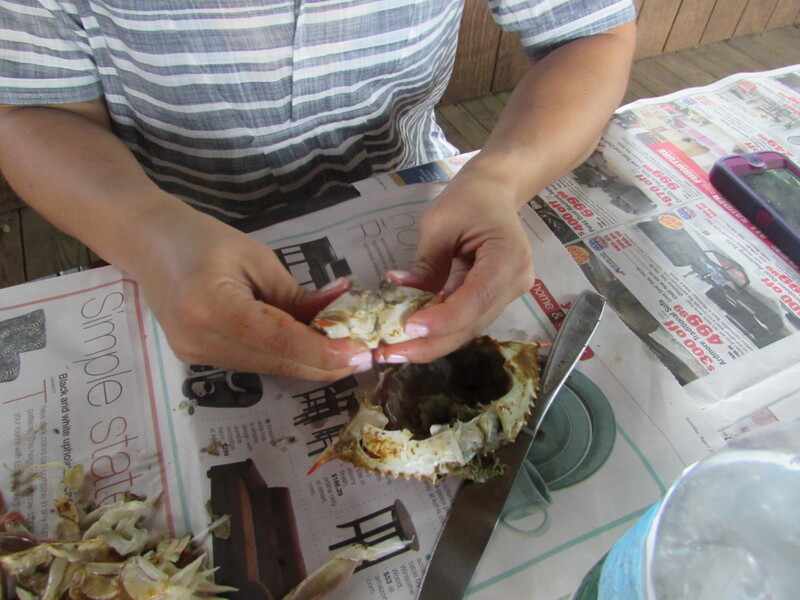 But this was a fun way to enjoy seafood! Can’t wait to do it again. 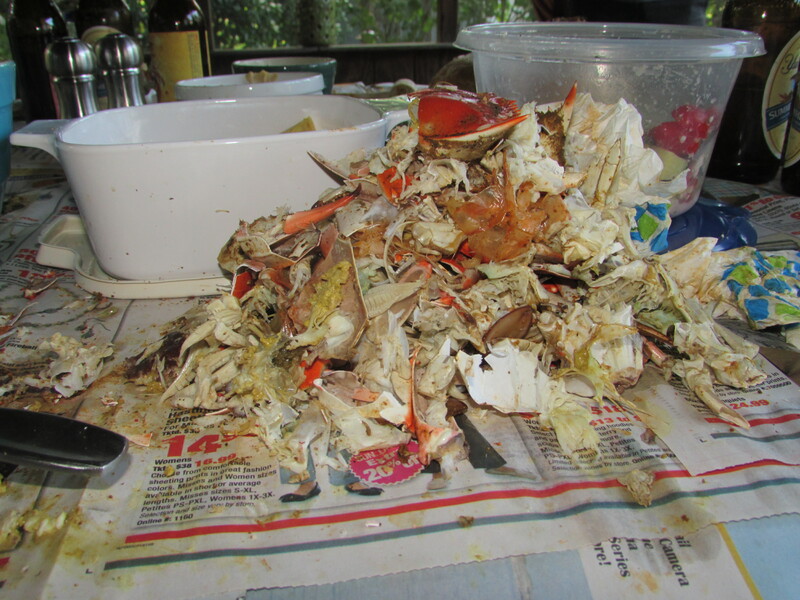 It simply isn’t summer without a crab feast! 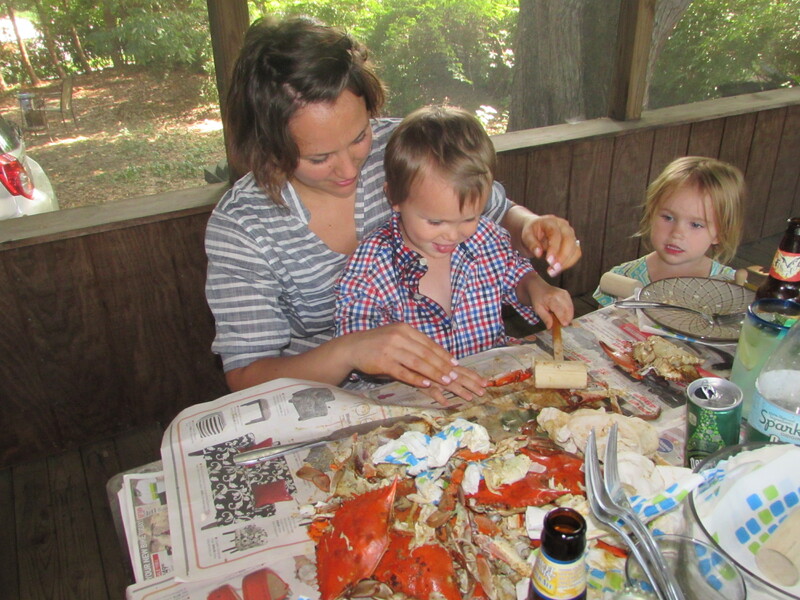 I started a similar how-to post a couple of years ago after a farewell party for my son who wasn’t going to have a crab feast for a while, but I got to the part about the steps to eating a crab and realized that, at least in my world, everyone has a “right” way. You handled that well, especially the part about having fun. Even if the thought of eating a crab isn’t for you, at least half the fun is the social interaction, and most hosts/hostesses have something else on hand so you’ll feel welcome. 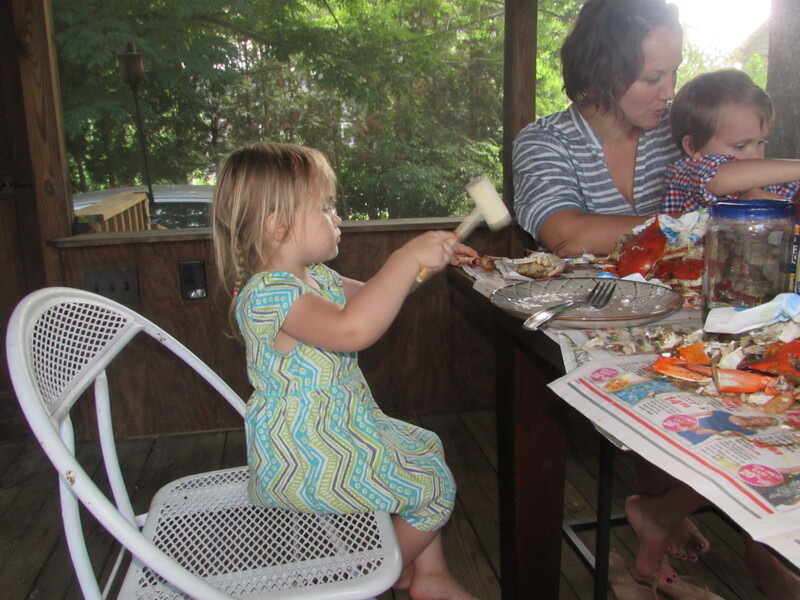 This was my first crab feast ever, and I plan to have a few more this summer. It’s such a fun way to spend an afternoon. And yes, you’re right, there’s definitely tried and true steps everyone can use to get at the meat, but I found myself just doing what worked. And the whole point is to have fun, right? Do you eat the “mustard”? We BBQ pork steaks here in my area. I bet you’ve never had one or even heard if it? Lol. Is that anything like a pork chop? We have delicious bone-in smoked pork chops at an area farmers market. So good! One of the things I miss from living near Baltimore! I knew I shouldn’t have ignored your text… I’ve had crab/crawfish/shrimp fests like this before, but not necessarily in Maryland. Luv the mess. 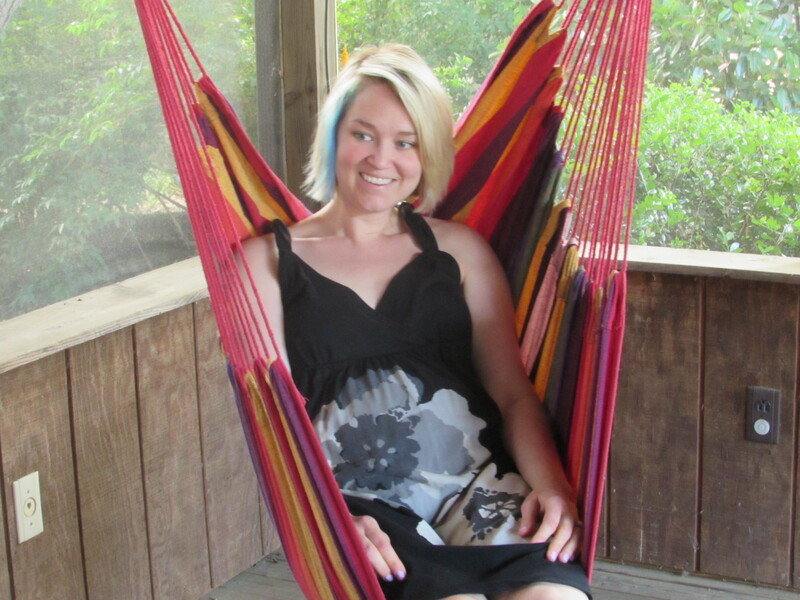 I’d always try to sit next to kids because they’d always miss a ton of the meat and I’d swoop in. You, Sir, are an opportunist (and smart to sit next to the kids). 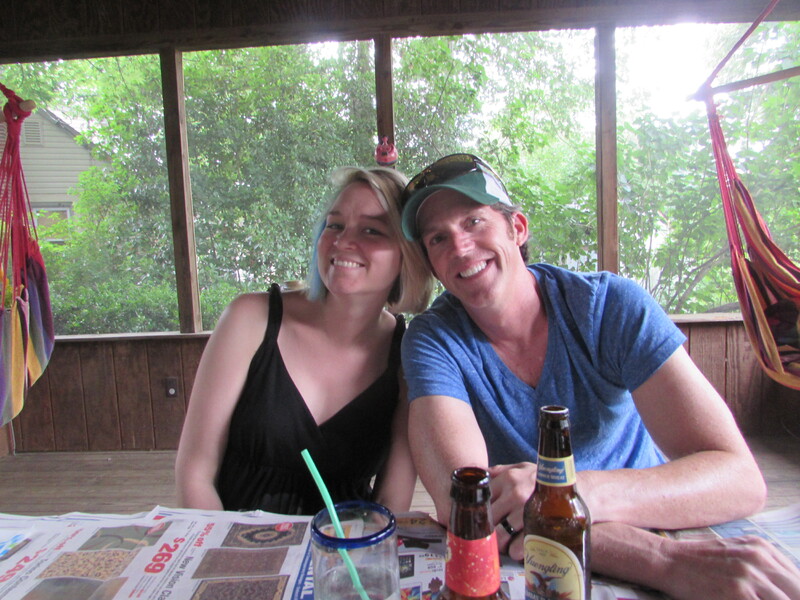 The mess, the newspaper, flying shells, and the beer–I love all of it. I expect a text next time you go to the Slurping Turtle (and a plane ticket). Haha! The Winegetter is in South Africa right now and was raving to me on Twitter about a restaurant. I told him the same thing – but me a ticket and I’m there !! I went to school in Maine, so like you, seafood means lobster (much easier to get at the meat, as you know). 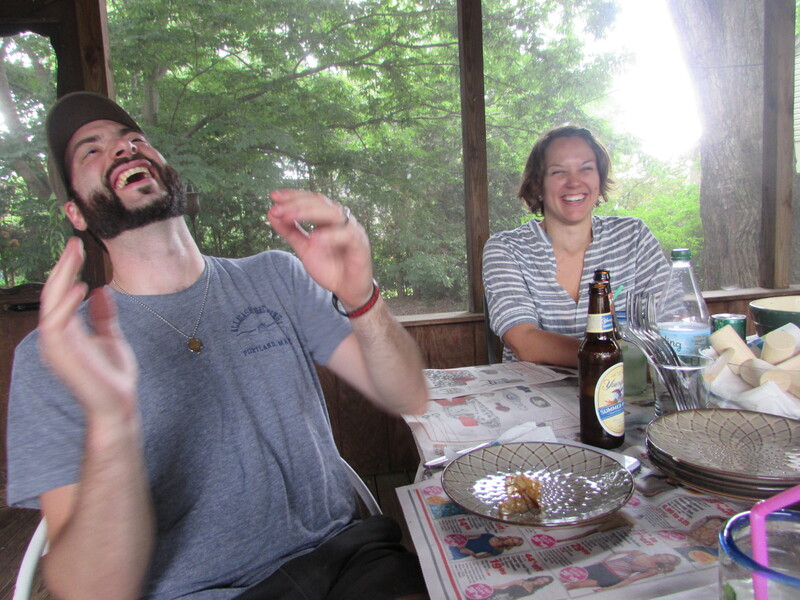 I lived in Baltimore for a while and did the crab thing often–as much a social event as a meal! I think it’s all about the social element. Can you imagine doing this with LOBSTER???? I think that’s something I’d like to try. I need this to be my new tradition! And Mr. Rache is wearing his Allagash tee! I wear mine constantly – it is SO. Soft. Maybe it’s made of that crab stuff we can’t talk about. It’s so much fun, Jules! Maybe we should do this in Maine but substitute lobster for crabs. Just throw a heap of them on a table covered in newspaper and go to town. I’m swooning at the thought. PS – it’s his favorite tee! Love crab! 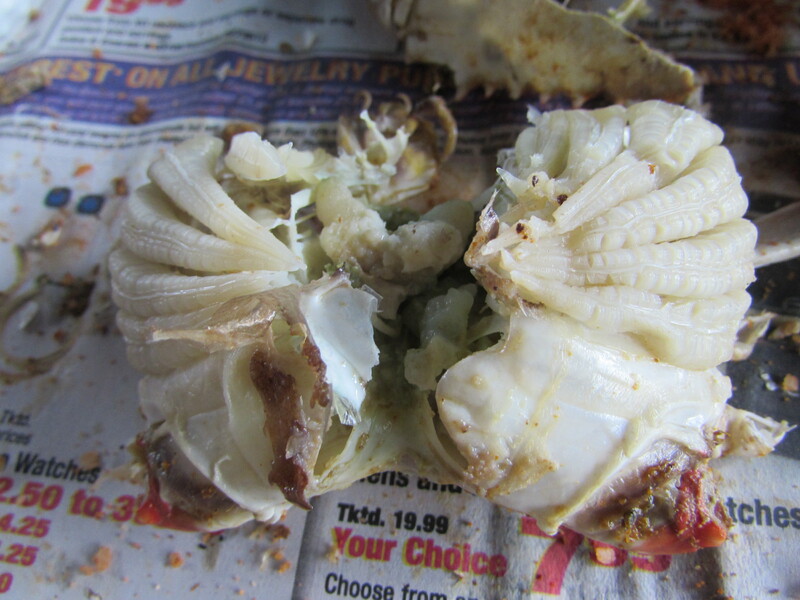 Grew up on Gulf Coast blue crab…caught our own with butcher scraps (chicken guts) as a kid. They are super delicious, if not a bit more work to get from sea to mouth,but sustainable catch is always best. Hope you enjoyed your weekend! Do you eat crab these days, Shannon? 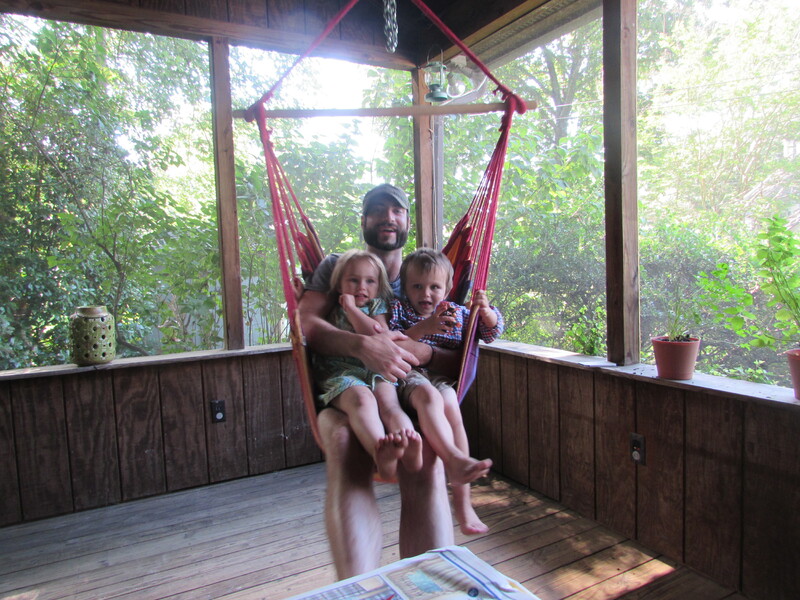 They are so worth the work! How does one score an invite to your next crab feast? Email me your digits and I’ll make sure you receive a text next time. What fun that would be! And I have a have a feeling any side dish you bring would be way more than incidental. C’mon up here and we’ll get out the mallets and have ourselves a grand ol’ lobster-crushing time! Yep, sounds about right. 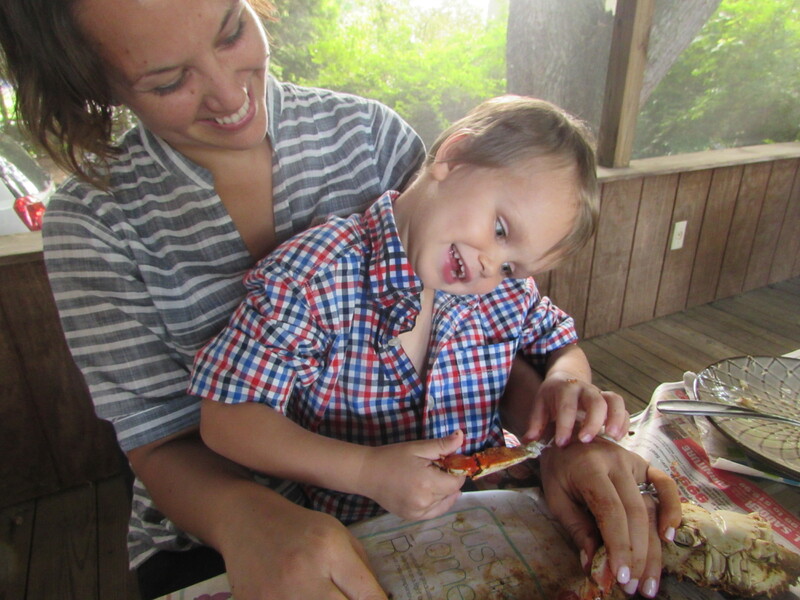 We’ve been trying to plan our first crab feast of the year with the fam, but everyone is so busy and we can’t seem to get it together. Hence, NO crabs yet this season for moi. The sadness is almost overwhelming. And then you have to post this tease of a post! For shame, Rach. And nary an invite, either. Jules and I could have made it there within just a couple of hours of an invite! Only if you bring some Mississippi crawfish (or is that only a Louisiana thing?). The more crustaceans the better! Mostly Louisiana, but you’ll find some here and there in some creeks here. 😉 I’ll be sure to bring some up! Heheh.